The European Union is urging India and Pakistan to “exercise utmost restraint” as tensions mount between the two nuclear powers around the disputed region of Kashmir. Mogherini urged them to resume diplomatic contacts and take “urgent measures,” without elaborating. She said the EU will remain in contact with both countries and closely monitor developments. India’s External Affairs Ministry in a statement says Pakistan would be well advised to ensure that no harm comes to Indian defense personnel in its custody. India said Wednesday that one of its air force Mig-21 fighter aircraft has been “lost” in an engagement with Pakistani aircraft in the Indian portion of Kashmir and that its pilot was missing. Pakistan earlier said it shot down two Indian planes and captured two pilots. Pakistan’s military now says that only one Indian pilot — not two — is in custody but still says they shot down two planes. Military spokesman Maj. Gen. Asif Ghafoor tweeted that “only one pilot” is in Pakistan’s custody. The tweet included a picture of a mustachioed man identified as the Indian pilot sipping tea. India says one of its air force Mig-21 fighter aircraft has been “lost” in an engagement with intruding Pakistani aircraft in the Indian portion of Kashmir and that its pilot is missing. India’s External Affairs Ministry spokesman Raveesh Kumar says that one Pakistan air force aircraft also was shot down and India’s ground forces saw it falling from the sky on the Pakistan side on Wednesday. Kumar’s statement came hours after Pakistan claimed that its air force shot down two Indian warplanes after they crossed the boundary between the two nuclear-armed rivals in the disputed territory of Kashmir and captured two Indian pilots, one of whom was injured. Kumar said India was still “ascertaining” whether its pilot was in Pakistan’s custody. India’s former ambassador to the United States says that a new red line with Pakistan has been drawn. Mansingh says a new doctrine was established by India’s pre-dawn airstrikes on Tuesday in Pakistani territory that Indian officials said targeted terrorist infrastructure. India’s Prime Minister Narendra Modi said afterward that the attacks paid homage to “India’s brave hearts” — an apparent reference to 40 Indian soldiers killed in a Feb. 14 suicide bombing in India-controlled Kashmir. Pakistan’s Civil Aviation Authority says it has shut its airspace to all commercial flights as tensions with neighboring India escalate further over the disputed region of Kashmir. Pakistan’s military says it has two Indian pilots now in custody, captured after the Pakistani air force shot down their aircraft on its side of the disputed region of Kashmir. The military’s spokesman, Maj. Gen. Asif Ghafoor, says one of the pilots is injured and is being treated in a military hospital. He did not elaborate on the pilot’s injuries. Ghafoor says the other pilot is in custody. Ghafoor says the Indian pilots “are being treated well.” He made no mention of whether they would be returned to India. New Delhi has not commented on Pakistan’s claim. Pakistan’s foreign ministry says the country’s Air Force is carrying out airstrikes from within Pakistani airspace across the disputed Kashmir boundary but that this was not in “retaliation to continued Indian belligerence”. Pakistan’s army spokesman says the country’s air force shot down two Indian warplanes after they crossed the boundary between the two nuclear-armed rivals in the disputed territory of Kashmir, and that one Indian pilot was captured. Maj. Gen. Asif Ghafoor says Pakistani troops on ground captured the Indian pilot. He says one of the planes crashed in Pakistan’s part of Kashmir and the other went down in Indian-controlled Kashmir. He says that “one Indian pilot was arrested by troops on ground while two are in the area” on Wednesday. Indian air force spokesman Anupam Banerjee in New Delhi said he has no information on Pakistan’s statement. 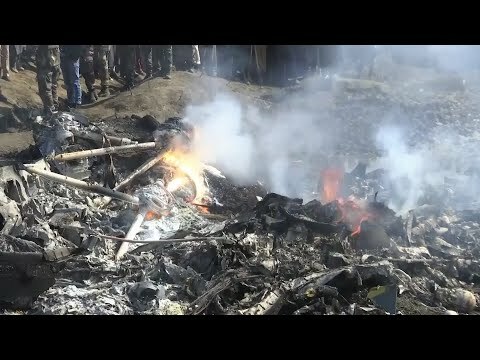 Earlier, senior Indian police officer Munir Ahmed Khan said an Indian Air Force plane crashed in Indian-controlled sector of Kashmir. It wasn’t immediately known if there were casualties. India’s External Affairs Minister Sushma Swaraj says the limited objective of Tuesday’s pre-emptive strike inside Pakistan was to act decisively against the terrorist Jaish-e-Mohammad group to prevent another attack in India. Pakistan-based Jaish-e-Mohammad group claimed responsibility for a suicide attack on a convoy of India’s paramilitary forces in the Indian portion of Kashmir on Feb. 14 that killed 40 troops. Pakistan said there were no casualties in India’s airstrike near the town of Balakot on Tuesday. Local police official Mohammad Altaf says six people, including children, were killed Wednesday in Kotli village in Pakistan’s part of Kashmir, which is split between Pakistan and India and claimed by both in its entirety.